Opium is the dried latex obtained from the seedpod of the opium poppy (Papaver somniferum). Opium is composed of several different alkaloids, including morphine, codeine, and thebaine which make up the main narcotic constituents of opium. Morphine is the most prevalent alkaloid in opium, comprising approximately 10-15% of the total weight. The other alkaloids such as papaverine and noscapine have no significant effect on the central nervous system. Frequently used in the production of heroin, opium is traditionally harvested by scoring the immature seedpod of the opium poppy, thereby allowing the opium latex to seep out through the incision. The fresh white opium latex is left for several hours to dry and is then collected by being scraped off the pod with a special blade-like tool. The opium is a yellow-brown sticky substance at this point and is further dehydrated before being used either in the production of heroin, or the alkaloids extracted and used for pharmaceutical purposes. The cultivation of opium poppies for medicinal properties dates back to ancient times. Opium continued to be widely used as a medicine throughout the American Civil War until the introduction of morphine, which could be injected at controlled dosages. Recreational use of opium became popular in China during the 17th century, with 1729 marking the beginning of opium prohibition in China, though usage continued to increase for nearly 200 years after prohibition came into effect. During prohibition in China, opium was trafficked into China by British through the East India Company under the control of the British. The Chinese emperor confiscated a large quantities of this opium in an attempt to stop the trafficking of opium into China, leading to the two Opium Wars in 1839 and 1858. Use of opium decreased in the early 20th century, with many countries now prohibiting production and use, and due to the wide availability of morphine and heroin preparations. Legal opium production is now done for the purpose of producing prescription opioid medications and is tightly regulated in most of the world. 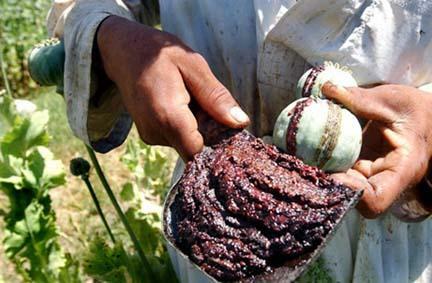 Afghanistan is the world's largest illicit producer of opium, cultivating 93% of the world's supply in 2007, though this number has since dropped to 64% of global cultivation in 2012. In the Western world, opium is no longer commonly used recreationally, though both heroin and many of the pharmaceutical opioids that are commonly abused are produced from opium. Opium is still available pharmaceutically in tinctures that are produced by a few pharmaceutical companies. These tinctures are essentially the same thing as laudanum, an alcoholic-preparation containing opium which was highly popular prior to the 20th century. Suppositories containing powdered opium and belladonna alkaloids are also currently marketed by Paddock Laboratories (acquired in 2011 by Perrigo) in the USA. None. The few pharmaceutical preparations of opium that are still produced are sold generically. half-life of 2-3 hours. When smoked, the effects of opium can last for several hours. In the United States, opium is a Schedule II drug. In Canada, opium is a controlled substance under Schedule I. Legal production of opium for pharmaceutical purposes is tightly controlled worldwide.